The latest Project Runway episode challenged the designers to dress Brooke Shields for her role in the TV show, Lipstick Jungle. I’ve never watched the show, but I kinda wanted to roll my eyes (again) at the shameless NBC cross-marketing machine. But, it turns out, I like Brooke Shields. She came off warm, down-to-earth, and I think I want to be friends with her. The designers, on the other hand, are ego-maniacs! Despite their inflated opinions of themselves, there were some good designs. Korto does it again, along with partner Joe, on her ethnic-bohemian getup. Unfortunately, the dress couldn’t carry itself alone. Unless paired with some funky animal print shoes, like these from Dolce & Gabanna? Roar. I so wanted to pair the dress with the Christian Louboutin leopard haircalf platforms, but I resisted. While I really like Jerrell’s use of textures, I wish I could take this outfit down a notch. I think Tim calls it “using your editing eye?” Get rid of the over-sized bag, sunglasses, and tone down that zebra-gold-trimmed belt (keep the zebra, save the gold accents for the shoes). The shoes in the gallery photo work, but I’d also consider these Tory Burch crocodile embossed slingbacks. Love the stacked heel and soft, patent leather peep-toe. Finally, the winning design. I would love Keith and Kenley’s creation for myself. The layered, high-waisted skirt and flowy, floral top — I’m a big fan. I’d get rid of the scarf, and maybe all the dark accessories. That way, I can pop into my own pink Ferragamos. Shoes and Cocktails would love to hear what you think about the designs, shoe pairings, and of course, what to drink! I think I see a martini in our future. Bitterly insane is exactly what I would be if I didn’t own these shoes. They are by far the most elegant (and expensive) shoes in my closet. Lucky for moi, I didn’t pay a dime for them (another shout-out to LC). They are classic and timeless. They are Ferragamos. Italian designer, Salvatore Ferragamo, was a pioneer of fashion. Born in 1898, he had already made his first pair of shoes at that age of nine. From a family of poor farmers, who couldn’t afford to buy shoes for his sisters’ first communion, Ferragamo borrowed materials from the local cobbler and made their shoes, rather than facing the same of seeing them wear clogs to church. Ferragamo’s talent and genius ascended him to Hollywood and he earned a reputation for being a “shoemaker to the stars.” Though my research is inconclusive, it appears he designed Dorothy’s ruby slippers in the Wizard of Oz, and he’s credited with inventing the wedge(!) in 1938, for Judy Garland. 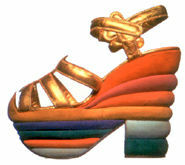 His most famous invention was the cork wedge, which paved the way for platforms. He was a visionary and an inspiration, and now, my obsession. The shoes are fitted for the red carpet and the streets of Paris. For me, they mean I have an absolute go-to item for any cocktail party, fancy dinner, or event where I want to stand out. If it is a party I’m hosting? Bring on the bruschetta, antipasto, caponata, and this unique pre-dinner cocktail. I can’t get enough of the old-school cocktails. The Negroni is a perfect match because of its sublime color, because it is Italian, and because it is made with Campari. The Negroni was invented in Florence in 1919, at Caffe Casoni, because Count Camillo Negroni added gin to his favorite drink, the Americano. 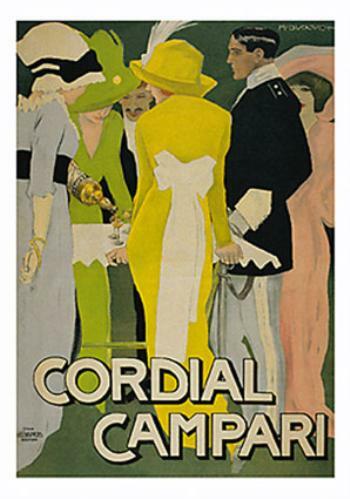 Campari, the notable ingredient, is definitely an acquired taste, and is probably better known for their vintage posters. It is a grand aperitif. I’ve altered the original recipe slightly by adding extra sweet vermouth and extra orange. I definitely recommend this version for first-timers. The bitterness is like nothing you’ve ever tasted.